"Holy smokes, that's a big cow!" Are you looking to make a big time impression at your next costume event? 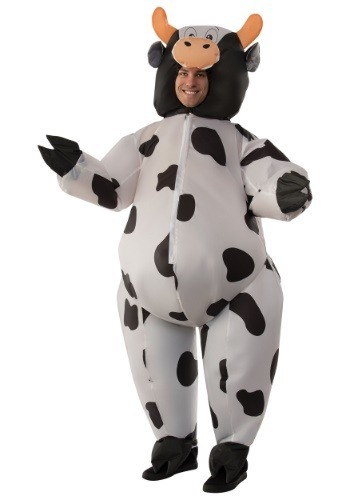 Are you looking to throw down some serious "moooves" at the costume dance? Are you ready to use a battery operated fan to inflate yourself to epic proportion? If it's yes to any of the above (or even just one) then we are speaking the same language. And that also means that we're going to need to get you into this Inflatable Cow Costume for adults! Seriously fun, this classic costume is the perfect way to make a very big, and very spotted impression at your next get-together. Whether you're partying on Halloween night, or are just looking to bring a little barnyard fun to school or work, this signature costume will have you looking like you just rolled in from the farm. A simple polyester jumpsuit made from a windbreaker material inflates with a battery pack that conveniently clips to the waist or fits in the pocket. Cartoonish cow facial features on the hood complete the theme, and this costume secures around the chin so you don't have to mess with any see-through visors either. Just arm yourself with 4 AA batteries (maybe a few extra if you've got a long event planned) and you'll be ready to "blow yourself up" into one heckuva cool cow. Practice your moos and get ready to chat up all the other animals at the shindig. When the chickens and piggies get a load of you, well, you're going to be the one in charge of all the fun!